The last few months I’ve been reading dozens of informative and sometimes funny DIY remodeling blog posts. Mostly because I needed to read about other people’s headaches and successes with home remodeling and renovation. I thought it might make me feel better about the visual chaos that ensues my house right now. Sadly, it did not. I’ve decided I’m much better at handling schedule chaos. Visual chaos drives me nutty. Orange Home Depot buckets filled with tools and tile pieces, nails and pipe fittings casually sit in various corners of the house. Old doors leaving and new doors coming in. A giant bathroom vanity in the garage waiting to be installed along with new paint and tile flooring. And an enormous gray and blue commercial heavy duty vacuum cleaner sitting in the middle of my den. My oldest gal calls this monstrosity “R2D2”. Yep, Ranger Craig and I are Do It Yourselfers. A few years ago (when I was younger) I proudly stated that fact. Until then, schedules are filling and its back to school for the two Sassy Bennett gals. Dinner becomes a little more challenging to achieve, but I’ve always got a quick recipe in my back pocket. You’re going to love this one! 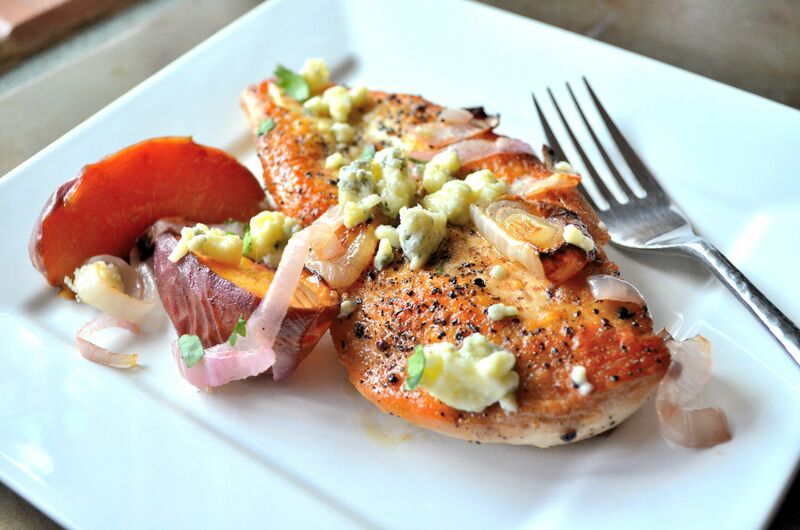 Roasted Chicken and Peaches with Tangy Red Onion and a sprinkling of Bleu Cheese. A most delicious combination of flavors that savor the last of our summer season. Pre-heat the oven to 350F. Season the chicken with salt and pepper. In a large skillet, heat the oil over medium high heat. When the oil is hot, brown the chicken breasts on both sides and then transfer the browned chicken to a baking dish large enough to hold the chicken and peaches. Browning the chicken breasts first before finishing in the oven allows a nice color/flavor to develop while keeping the inside of the chicken breast moist. Toss the peaches and red onion with a drizzle of oil and sprinkle with a little salt and pepper. Pour them in the baking dish arranging them around the chicken. Place the baking dish in the oven and finish cooking until the chicken reaches 160-165F internal temperature or about an additional 10-15 minutes depending on the thickness of the chicken breasts. Be sure not to overcook the chicken as it will make them tough and chewy. If roasting chicken pieces, follow the same browning instructions but don’t add the peaches and red onion until about 10-15 minutes prior to the bone in chicken being done. Once the chicken is done transfer the chicken to a platter, scattering the peaches and onion over top and sprinkle with the bleu cheese. Serve immediately. I love this dish served with a simple salad of fresh greens and a balsamic or French vinaigrette, or roasted green beans with toasted almonds and brown butter. I am totally inspired by this recipe and I am working up a way already about how I can remake this amazing sounding dish with our products. 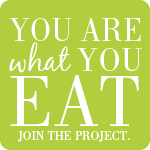 thank you for being a foodie inspiration! Awww…. thanks Alli! I try, but don’t always acheive the perfect picture. Definitely depends on the light that day. This looks so SUMMERY and YUM! Never thought of pairing roasted peaches with chicken. A brilliant idea. Thanks Angie! I love fruit with poultry and fish. 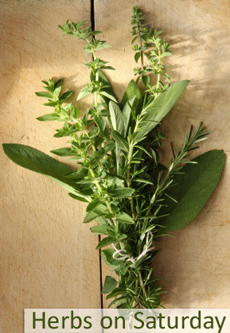 Its a great way to cook with whole foods and create new flavors. I hope that R2D2 takes his leave soon. 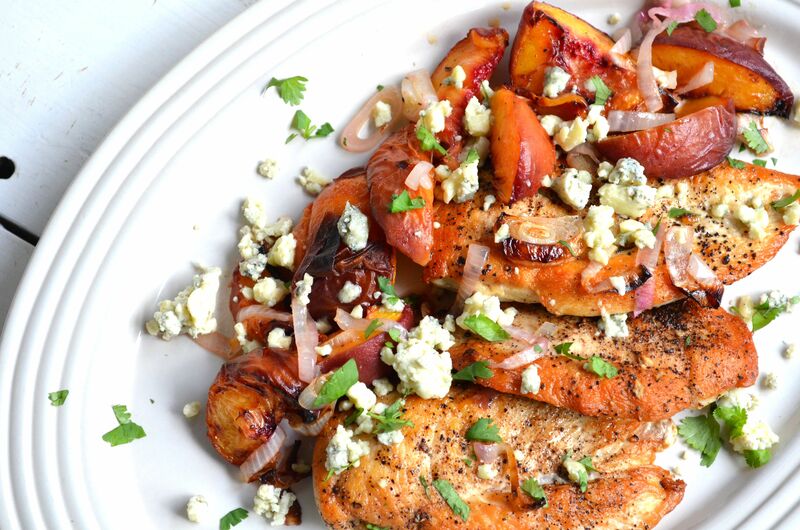 Blue cheese, peaches and chicken — wow, that sounds amazing. I really would like to make this before the warm weather comes to a close for the season. Good luck with your renos! Good for you to take this on, but I can imagine that the chaos in your home is a bit unnerving. I read some of those DIY remodeling blogs, and, although it’s so inspirational, I don’t envy the mess it leaves. Hang in – sounds like all the work will pay off! 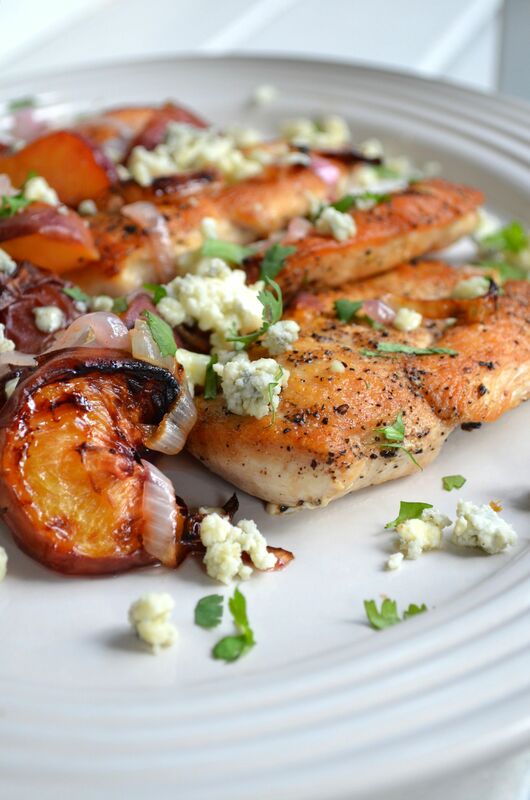 Love this recipe combination – blue cheese and peaches, yum! Thanks Jess! Just a few more months and hopefully it’ll all be done and I can reclaim my house hahaha! I too adore bleu cheese and peaches and often serve them on a salad with grilled steak slices. The chicken was a yummy change. Have a fabulous week! Thanks Spree! Yes, remodeling has its challenges but in the end I know I will love the finished bathroom and new doors. Can’t get done soon enough however. 🙂 are your kiddos back to school? Remodeling with your hubby is a test of one patience for sure…good thing you’ve got your kitchen to escape to. This looks divine! Love any savory dish with peaches. One of my favorite combos. Thanks Erina! Yes, remodeling with the hubby is challenging at times. Years ago, we learned never to wallpaper together. Totally a one spouse operations. LOL! Oh yes, please! I love using fruit in dishes with pork or poultry! Me too! And topped with stinky cheese makes it even better. 🙂 have a fabulous week! I love to look at DIY projects though I don’t have a crafty or repairing bone in my body. I stick to the looking! 🙂 this looks delicious. Our peaches are so great right now, this is going on the dinner menu for this week!! Hahaha! Kelley, I never had a crafty bone in my body until we bought our little 1968 cottage. Then I was sort of forced to become crafty, that or live in a house that had never been updated. It was cute, but not that cute. My husband and I decided were building the next house from scratch. No remodeling projects! 🙂 Hope you enjoy the recipe. I LOVE roasted peaches and this made it easy to use up my extras that were turning to ripe. Have a great week Kelley!! I can completely identify with busy! But somehow dinner still has to happen. So I’ve come up with a few ideas that uses whole foods to accomplish the task. So far my family likes it all. 🙂 Have a lovely week BAM! That chicken sounds divine, Karista! I adore peaches but have never paired them with poultry before – great idea. Karista, I feel your pain. I never want to live through another remodel again, but you know that it’s worth it in the end. Hardest part was the meg-shift kitchen on a cart with microwave and hot plate as appliances. And this latest recipe is delicious sounding as always with the peaches and bleu cheese – yum! Thanks Danny! I do remember our kitchen remodel five years ago. Painful! LOL! But you are right… it’s so worth it in the end. Have a happy Labor Day! Gorgeous photos! I’ll be making this. It looks wonderful and pretty straightforward. FWIW, my husband and I are DIYers as well and there has been a hole in my front hall lathe and plaster for almost a year now (from updating some wiring) and will stay there until we take the plunge and re-do the kitchen. Sigh. I’m in Seattle too so if you end up finding a good contractor let me know! Oh so you absolutely understand my “visual chaos”! Hahaha! It really does drive me nuts but I keep reminding myself it will all be finished one day soon. 🙂 And yes, will do. If I end up with a good contractor I will definitely let you know. Thanks for stopping by!! Thanks for the pingback! I was excited to see you are from the Northwest too. I will definitely be checking out your blog for cooking tips and recipes! YUM – how great do those pictures look?! Love the idea of bleu cheese with the sweet peaches. What a great way to liven up some chicken breasts – this sounds like an awesome ‘back pocket’ recipe!